After watching countless fighters exit UFC events last year for various wounds, the injury bug is already doing its thing not even a month into 2013. On Thursday morning, it was announced an undisclosed injury has forced Dennis Siver out of his featherweight shootout with Cub Swanson. 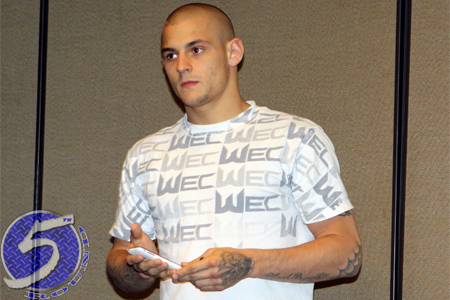 Up-and-comer Dustin Poirier (Pictured) has agreed to serve as a last-minute substitute on February 16th. Poirier was on the cusp of sniffing a championship affair until getting submitted by “The Korean Zombie” Chan Sung Jung in May. “The Diamond” rebounded nicely by tapping out Jonathan Brookins just last month. Swanson will be riding a three-bout winning streak into the pivotal scrap. He was most recently seen putting Charles Oliveira to sleep at UFC 152. Swanson vs. Siver was slated to co-headline the gig. It is believed the new matchup will maintain second-to-top billing. ‘UFC on FUEL TV 7‘ takes place inside Wembley Arena in London, England. FUEL TV will broadcast the main card live beginning at 3PM ET/12PM PT.